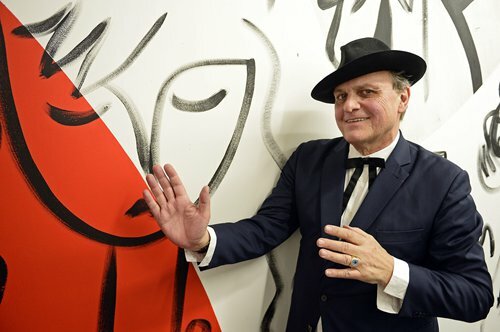 "We are happy to welcome Jean-Charles de Castelbajac into our big family," United Colors of Benetton boss Luciano Benetton said in a statement, hailing the designer's ability to "forecast tomorrow's social and fashion trends." "Born from a mix of punk and pop, his style is characterized by the use of strong colors and pop icons, the mix of old and new and a whimsical and irreverent touch," said Benetton, whose company has suffered dwindling sales for a decade. "United Colors of Benetton and I have always had a similar take on fashion, characterized by the passion for knitwear and the love of pop and rainbow colors," Castelbajac said. The museum hailed the maverick Castelbajac's "witty and flamboyant" designs that have dressed stars from Farah Fawcett in 1970s series Charlie's Angels to Mick Jagger and Elton John. "Castelbajac's childhood was spent surrounded by the bleak colors of a military boarding school," the museum said. "He 'hijacked' materials in his first show, refashioning materials such as oilcloth sponges and floor cloths into an award-winning collection. The star of the show was the coat cut from his boarding school blanket." Their sweaters proved popular items in local stores and a brand was born. Their signature soft wool jumpers made in a variety of colors quickly seduced the masses. The company went from strength to strength especially between 1982 and 2000 - its fame fueled by daring ad campaigns by Toscani, such as a 1989 poster which featured a black woman breastfeeding a white baby.